Miami Art Basel closed its doors this week on a whirlwind of neon lights and interactive installations – but this December, as the city was once again transformed into a playground for the contemporary art world, it also housed an exciting new venture for a brand whose connection to that universe is unparalleled. 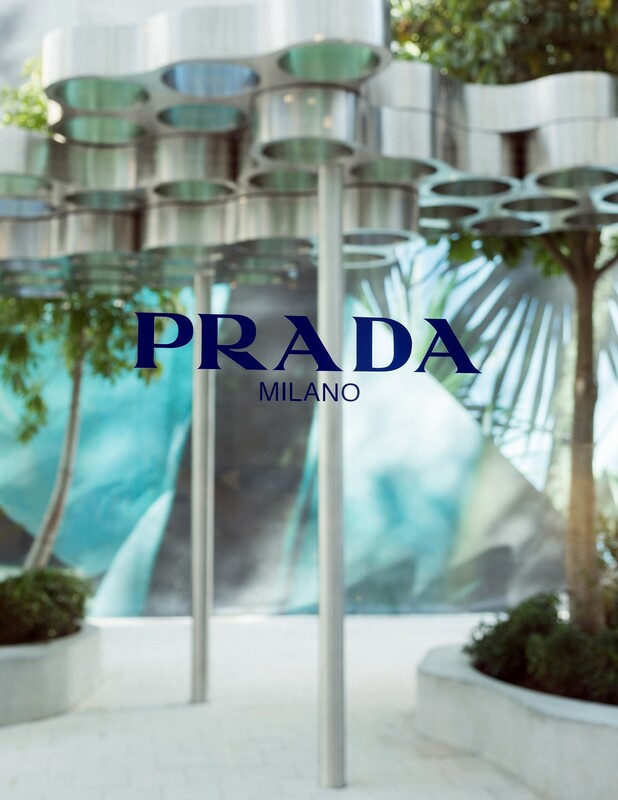 Nestled in the heart of Miami’s prestigious design district is a unique new Prada concept store, flanked by a roster of fellow luxury brands and a stone’s throw from the city’s equally box-fresh Institute of Contemporary Art. Perhaps unsurprisingly, the space is a wonderfully unique marriage of fashion, architecture and design. The house is known for its longstanding collaborative relationship with artists and designers alike. Alongside the endless references which feature in the collections, there is the Fondazione Prada – which houses both permanent and a continual rotation of temporary exhibitions from both Mrs Prada and her partner Patrizio Bertelli’s private collections, and works by the likes of Anish Kapoor, Louise Bourgeois and Marc Quinn. Not to mention another recent Art Basel moment, Carsten Höller’s Prada Double Club Miami, a neon ‘living art piece’ which first debuted in London in 2008. “The store concept was created specifically for the location,” explains Stefano Cantino, Prada’s group strategic marketing director, and the man responsible for heading up this venture. “It’s a new concept for Prada, and this particular store will be unique to Miami.” The idea is simple yet original, and undeniably Prada; inspired by the unique biennial cultural exchange between Italy and Latin America that has been taking place in Rome since 2003, and also by Miami’s own iconic Art Deco façades, the space is a beautiful amalgamation of each culture. 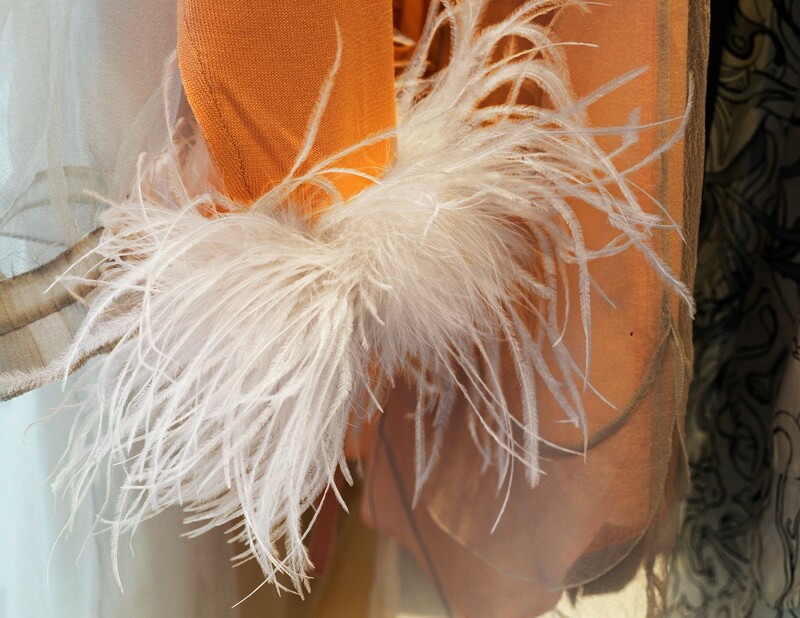 Feather-trimmed, heavily embellished Prada pieces will sit amongst a selection of Brazilian furniture – designed during the era of the exchange’s beginning – by the pioneering practitioners of mid-century Modernist design. The designers and pieces featured in the space have, of course, been hand-picked by Mrs Prada. “They have specific angles and elements and the periods of time in which they were designed has specific relevance. 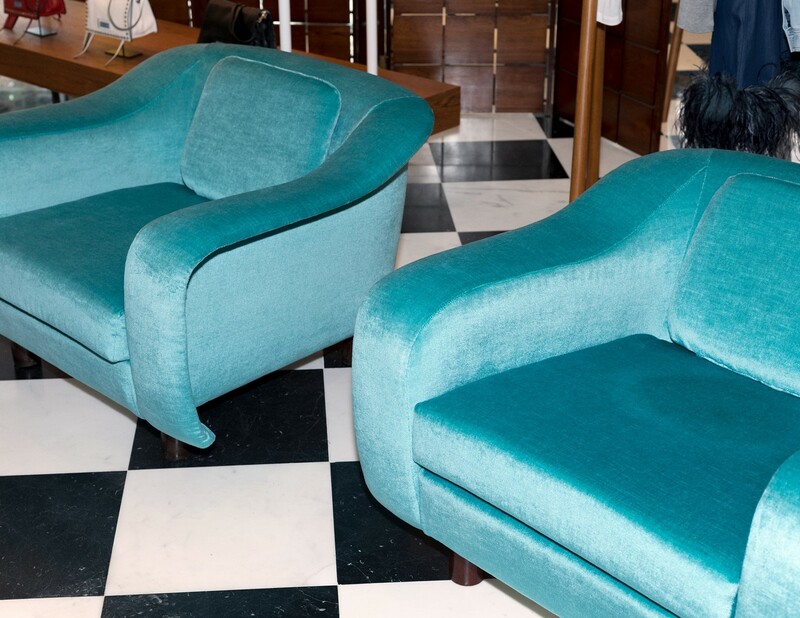 They make sense alongside Prada pieces, and fit very well in the Miami environment,” says Cantino of the selection, which are mostly crafted from Brazil’s native Jacaranda, a form of rosewood. “All of the pieces are very special.” Amongst the selection are a wonderful, impossibly curved sofa and armchair pairing by Jorge Zalszupin; a series of chairs lined with velvet upholstery in a Prada-esque palette of sage and teal by José Zanine Caldas; and a collection of exquisitely crafted room dividers and glass-topped tables – which would not feel out of place in the Prada Fondazione’s Wes Anderson-designed Bar Luce – created by ‘the father of modern Brazilian design’, Joaquim Tenreiro. The space in which these sit is an artwork in its own right. “There was a big cultural inspiration from the surrounding area,” adds Cantino. 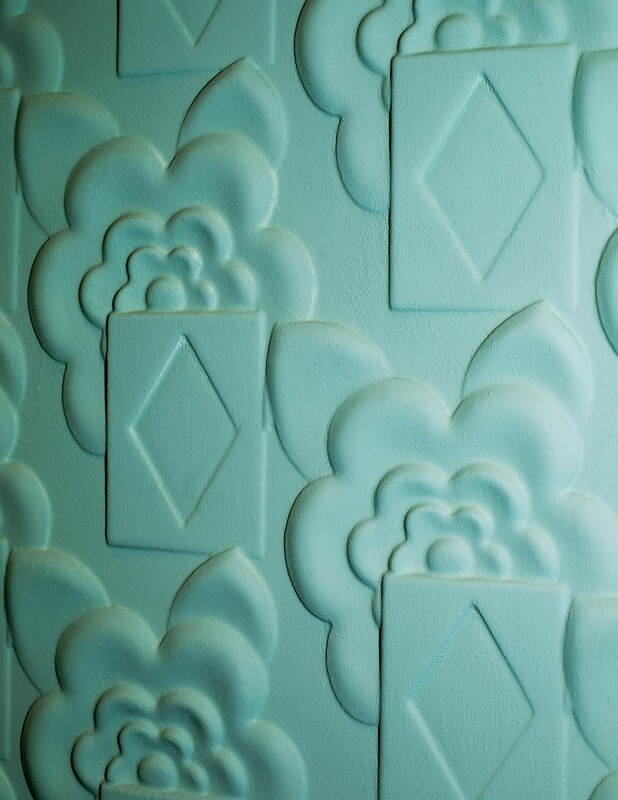 “The gardens and colours of Miami are all important elements.” The walls, although painted in signature Prada green, have been reimagined in textured cement patterns of Prada prints past; an homage to the pastel facades of Miami’s trademark ‘Tropical Deco’ buildings. 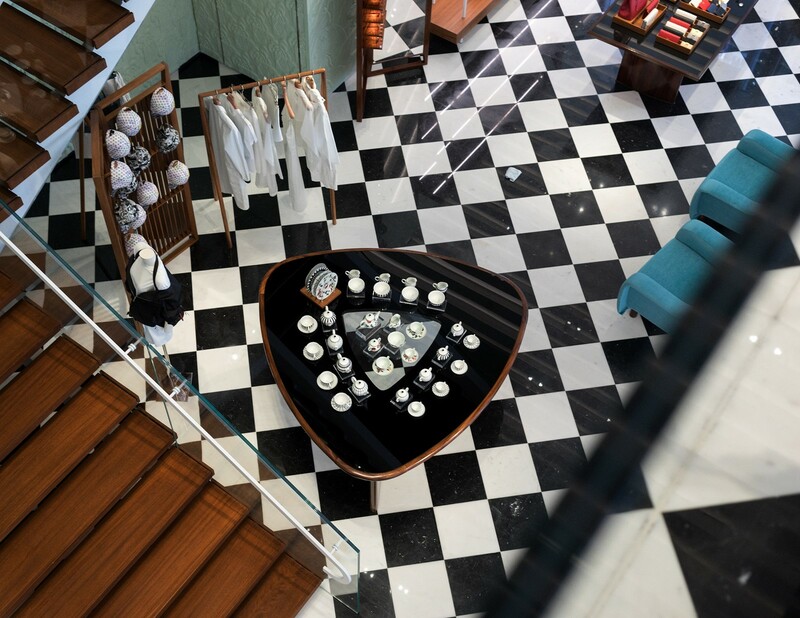 These are offset by a floor made up of chequered black and white marble, a now iconic element of the brand’s DNA, and the flooring used for the very first Prada store in Galleria Vittorio Emanuele II in 1913. The focus is then undeniably on the timeless beauty of the Brazilian designs, as they appear naturally throughout the space, resplendent in rich chocolate tones. The overall result is something off-kilter and unexpected yet satisfyingly cohesive, in a way that only Prada can be. 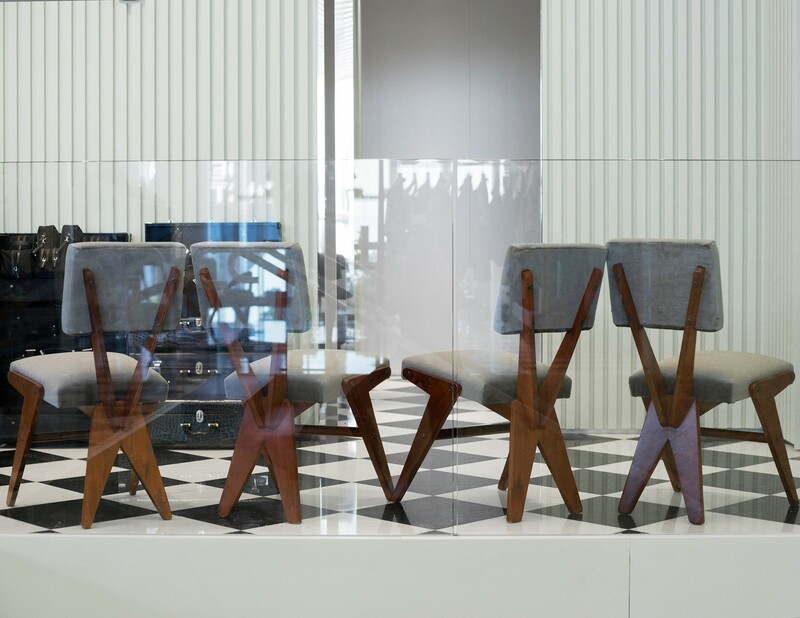 Prada’s new store in Miami’s Design District is open now.